Columbia, Mo. (Nov. 30, 2018) — Graduate student Alexis Allison is the winner of the 2018 James and Patricia Atwater Memorial Writing Prize. The award provides a $500 stipend to one elite writing student each year. 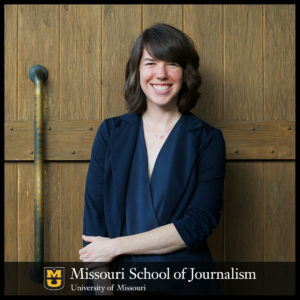 Current master’s student and reporter for the Columbia Missourian Alexis Allison, winner of the 2018 James and Patricia Atwater Memorial Writing Prize. Photo: Jo De Castro. “River Man: How Jeff Barrow’s Love for Water Unites Missourians,” published Aug. 12, 2018. “Building Trust: Community Policing Requires Shared Humanity,” published July 1, 2018. “Separate and Unequal: How Lincoln’s Land-Grant Funding Woes Hurt Missouri’s Small Farmers,” published April 1, 2018. The judges said Allison’s work was characterized by clear, lyrical writing, abundant detail, elegant use of language and a nuanced approach to complex topics. Allison is a first-year master’s student studying data journalism. Her bachelor’s degree was in creative writing from Pepperdine University in California. Before coming to MU, she taught high school English and journalism in Los Angeles. Allison also received a copy of Eudora Welty’s “One Writer’s Beginnings,” which was a favorite of the late Jim Atwater, former dean and faculty member of the Missouri School of Journalism. This annual prize is given in memory of his love of writing, this School and its students. The Atwater Prize is open to students in all sequences and was founded in memory of James D. Atwater and his wife Patricia Atwater. James Atwater was dean of the School from 1983-1989 and a professor of magazine and editorial writing. During his lifetime, Atwater published several books and worked at publications such as Time magazine, The Saturday Evening Post and Reader’s Digest. He died in 1996 of cancer. Patricia Atwater was a former instructor and copy editor at the Columbia Missourian. She died in 2018. Gifts to support the annual James and Patricia Atwater Memorial Writing Prize can be made by visiting the Giving to Mizzou website.